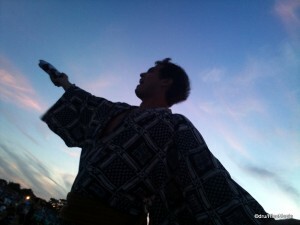 Summertime in Tokyo is a time when you can go to many different festivals. The usual summer festivals with various food stalls selling okonomiyaki and yakisoba exist, and there is a lot of dancing that happens at these festivals. The most popular annual festival has to be the fireworks festivals. These are held weekly starting in the last weekend of July. 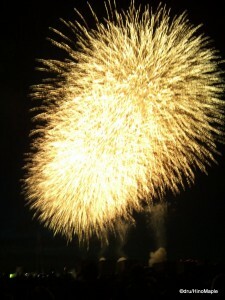 There are several famous fireworks festivals in Tokyo. These include the Sumida River Fireworks (last weekend in July); the Edogawa Fireworks (first weekend in August); Tokyo Bay Fireworks (second weekend in August); and the Meiji Jingu Fireworks (end of August). Of course, there are several more in and around Tokyo, but these are the biggest festivals. If you are in Tokyo at that time, and have a day to spare, it’s a good idea if you can make it to one of these fireworks festivals. If you can’t, I wouldn’t worry too much as you can see video of this at various places on the internet, especially on YouTube. Sea of people and blue tarps. This festival has been going on since 1995 and I have grown to become extremely critical of the types of fireworks used, how it’s used, and the use of music within a fireworks display. Needless to say, fireworks festivals are no longer as “enjoyable” as used to be. In Japan, fireworks festivals are not about a competition. It’s about impressing people with various fireworks, including the use of a large amount of fireworks to impress the crowds. 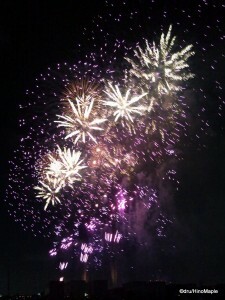 I have seen a couple of fireworks displays around Tokyo since I first came here. The first time I saw the fireworks was in Atami several years ago. Atami is a beach resort that is famous for its onsen. 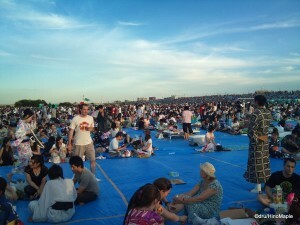 Recently, I have had the pleasure to go to the Edogawa Fireworks festival. 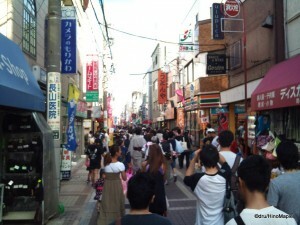 The atmosphere in Japan is extremely different compared to Vancouver. 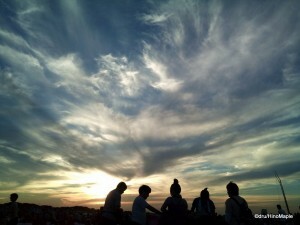 The first thing you have to realize is that the festival is very calm and relaxed. If you go to a festival in the city, such as the Sumida River Fireworks, you should expect to see people all over the place. Since there is limited park space near the fireworks, it’s customary to see people set up their “camp” on local streets and just wait there for several hours. My friend John, owner and star of Weblish was kind enough to spend a lot of time reserving a huge area in a park next to the fireworks. We had what was one of the best seats in the city. If you do go to a fireworks festival, and you do find a way into a nearby park, expect to see a sea of blue tarps on the ground. It’s customary for Japanese people to rush into a site when it’s opened up and set up these tarps to reserve their area. You can usually set up shop up to a day or so in advance, but it depends on which festival you are attending, and the rules for the year. The second thing to note is that by the mid afternoon, people start to flood into the area. This is a festival, and like any festival, people like to make it a big event. When you get a spot to watch the fireworks, the next thing to do is relax. It’s a great time to be with friends and enjoy the conversations. To be prepared, bring lots of food and lots of drinks. The great thing about Japan is that you can drink in public. It’s necessary to bring enough alcohol to keep yourself happy up to and including the fireworks. Bring enough snacks so that you won’t be starving after the fireworks. The only question is where to use the washroom. Like any public event, expect lines to use the washroom. I had the unfortunate event of needing the washroom about halfway through the fireworks, and had to wait a bit to use it after the fireworks. It wasn’t bad, but it’s not something that I’d feel comfortable doing again, if I could help it. As I mentioned, fireworks in Japan are all about amazing the crowd. They usually start with a countdown, if you are near a speaker, followed by a large display of fireworks. They tend to go in a 10 minute loop. There are a few minutes of spectacular fireworks that light up the sky followed by several minutes of smaller fireworks. They tend to go one after another rather than several at the same time. I believe this is done to allow the smoke to dissipate for the next round of large fireworks. This entire process is repeated for just over an hour. If you are worried about catching a train to escape the area, you should think about leaving 10 minutes, or earlier, from the area. If you wait till the end, you could be waiting for over an hour to just get to the station platform before you can wait for a train. Needless to say, the trains are packed as badly as the morning rush. If you don’t want to wait in line, chill out at your spot for at least 30 minutes, and then try to find a place nearby that you can just hang out and spend money for a couple hours. If you are lucky, you’ll have a friend who lives nearby and you can just hang out there until the trains aren’t too busy. The fireworks ended at around 8:30pm, and I left my friend’s house around 11pm. The train was still packed as if it was the morning rush hour, but at least the station platform wasn’t that busy. Comparing fireworks in Japan to fireworks in Vancouver is not an easy thing to do. Vancouver is a beautiful display that is timed to music which makes it more art that spectacular. In Japan, it’s the opposite. It’s all about impressing the crowds with images such as famous Japanese characters, and also to have the largest size of fireworks possible. I’m not sure which is best, but both have their merits. In Vancouver, everything feels different. In Japan, with alcohol, things just feel like a party. I can’t truly explain the difference. You must go and enjoy the show to understand the difference, but it’s something that must be done if you have the chance to experience it. This entry was posted in Fireworks, Tokyo and tagged blue tarp, Celebration of Light, Edo River, Edo River Fireworks, Edogawa, Edogawa Fireworks, festival, fireworks, japan, Jingu, Jingu Fireworks, Sumida River, Sumida River Fireworks, Sumidagawa, Sumidagawa Fireworks, Symphony of Fire, tokyo, Tokyo Bay, Tokyo Bay Fireworks, Tokyo Fireworks, vancouver, Vancouver Fireworks, Weblish, バンクーバー, 日本, 東京, 東京湾, 東京湾花火大会, 江戸川, 江戸川花火大会, 花火, 隅田川, 隅田川花火大会 by Dru. Bookmark the permalink. I know how you feel. Bang bang bye-bye? Then again, I’m not really “bye-bye”. I’m more, “let’s keep drinking” so I don’t have to deal with the trains home. Let me get that Smirnoff for you.